Pezinok is a city in southwestern Slovakia. 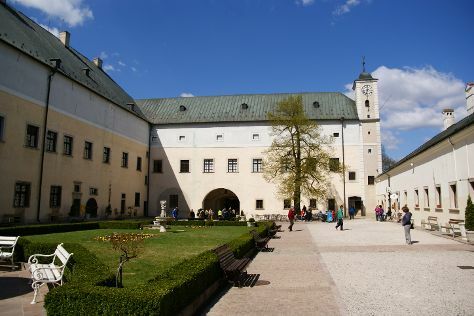 It is roughly 20km northeast of Bratislava and, as of December 2014, had a population of 24,070.Pezinok lies near the Little Carpathians and thrives mainly on viticulture and agriculture, as well as on brick making and ceramic production.HistoryFrom the second half of the 10th century until 1918, it was part of the Kingdom of Hungary. Pezinok, or at least its surroundings, was for the first time mentioned in 1208 under name "terra Bozin". During the next few centuries, the town changed from a mining settlement to a vineyard town. It gained status of a free royal town on 14 June 1647. Pezinok had its most glorious era of wealth and prosperity in the 17th and 18th centuries, when it was also one of the richest towns in the Kingdom of Hungary. Its wealth was based on production of quality wines. In the 19th century, the town slowly began to industrialize: the first sulphuric acid factory in Hungary or the known brick works were established here. It boomed further after it was connected to railway. After break-up of Austria-Hungary in 1918/1920, the town became part of newly created Czechoslovakia. In the first half of the 20th century, it was declining, the vineyard production was declining, forcing many inhabitants to emigrate. It is growing again after the end of World War II.Geography and tourismPezinok lies at an altitude of 152m above sea level and covers an area of 72.555km2. It is located in the Danubian Lowland at the foothills of the Little Carpathians, around 20km north-east of Bratislava. Another major city, Trnava, is located around 25km to the east. Pezinok is in Bratislava Region. Plan a Slovakia trip in moments using our itinerary builder.